By default, Excel 2010 uses the 11-point Calibri font for cell entries, but you can change this to another font or font size of your choice for all new workbooks. 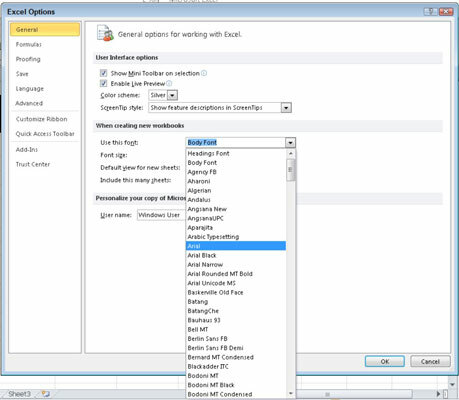 Changing the default font doesn’t affect the fonts used in existing workbooks. In the General category, click the Use This Font drop-down arrow. A list of available fonts appears. Select the desired font from the list. You may want to preview fonts in the worksheet before you choose a new default font. Click the Font Size drop-down arrow and select a font size from the list. The font sizes range from 8 to 72 points. If you don’t see the font size you want, you can type a different size, such as 9.5 or 15, in the Font size box. You must exit and then restart Excel to begin using the default font or font size.